Christmas shopping season started in November and continues through December and is typically a boom time for online retailers. But January and February are usually slow although there are consumers looking for bargains and merchants with excess stock. So how do we promote "after the holiday sales" that will keep business rolling. To help make additional sales in the first quarter of the year, retailers can offer free gift or discount coupons with purchase confirmations that are sent out with orders in the Christmas season. These coupons would only be valid after the Christmas rush closed, so from early January and could be tied to specific products or could just be general. So rather than offering a discount before Christmas you offer value to be received after Christmas helping to hold up your margins. How do we do this with ePages? 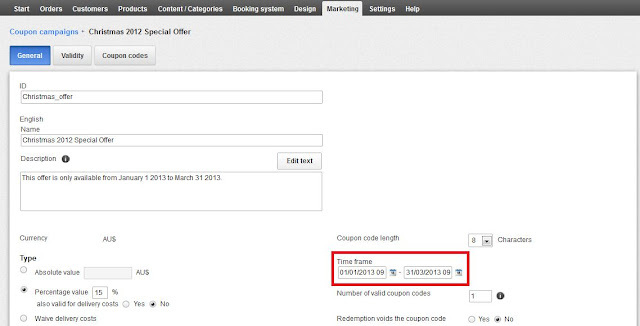 In ePages you can define coupon codes that can have a % discount, fixed value or free shipping. Coupons can be made to be valid for specific products, shipping methods and payment methods. These coupons can also have a start and end date. Creating a coupon is easy just go to the Marketing menu >> Coupons and create a new coupon campaign. When you setup the campaign you can create multiple codes or a single code. Once you create you coupon campaign then create your coupon code. This can be a single and simple code that you can easily remember like xmas2012 or you can auto generate the code. If you create a single code you can then add that code to your standard Order Confirmation email text that gets sent automatically with each new order. ePages sends automatically an order confirmation that you can customise as the store owner. You can do this by going to the Settings menu >> email settings >> Events >> Order conformation. In the Order Conformation email you can add additional text to the email. By adding some new "Christmas greetings" and your new Christmas special coupon code then every new order will receive the new code. You can also add a greeting and code to the Order Confirmation page on your website by customising the appropriate basket text at Settings menu >> Basket settings >> Texts >> Order conformation text. Take every opportunity that you can to attract your buyers back to your store to become frequent buyers. You can also create Customer Groups and offer special customers discounts for being loyal customers. Customer Groups can assist in managing and marketing to your customers. As a tip you can create customer groups around frequent product categories so you can quickly ascertain individuals products interest. But Customer Groups is a whole new topic. I hope that the Christmas season delivers loads of new business and new customers. But remember to offer exceptional customer service and turn new customers into loyal customers. This definitely worked for us after the holidays. It was one of the things I learned when I attended an e-commerce seminar and it has deemed very effective. Enjoying a holiday treat to finding the perfect Christmas sales. Keep on updating us with your informative post. I used things remembered discount codes . My go to place whenever I buy online. There's always a code to use! I think the coupons idea is going to be very successful. This is because the chances of people returning back to the particular e-commerce website are very high once they got hold of the coupons for promotions. Who would not want to get more things if they have been granted a discount even if it is only for a small fraction off the retail price. As a consumer, I truly believe this concept will be benefiting both retailers and consumers very much.